A news article by Samantha Wohlfiel from of the Bellingham Herald reports that starting this July, Bellingham Police Department (BPD) will require all uniformed patrol officers to wear and use body cameras. Initially, 18 officers volunteered for Bellingham’s program, and currently 34 officers are using the cameras, Cook said. He also mentioned that his police officers have noted that people often change their behavior for the better when they’re told they’re being filmed. Basically, the “policy” requires that officers turn on the cameras for any enforcement activity, an arrest, use of force or where they believe there will be the need to use force. The department has a mix of cameras, some that are clipped on a lapel, others that are worn on glasses, but both have easily been knocked off in situations where officers were restraining someone, Cook said, so the department may shift toward other models. Between 2014 and 2016, the total program cost has been $315,250, which includes things such as all hardware (the cameras, clips, glasses they sit on, etc. ), software and docking stations, Cook told the council. According to the article, the projected costs moving forward are about $35,000 to $56,000 per year each of the next two years for renewed data storage management. The current policy requires that officers turn on the cameras for any enforcement activity, an arrest, use of force or where they believe there will be the need to use force. My opinion? This is a step in the right direction. Body cameras make everyone behave better. They also catch evidence of what really transpired. Good move, BPD. 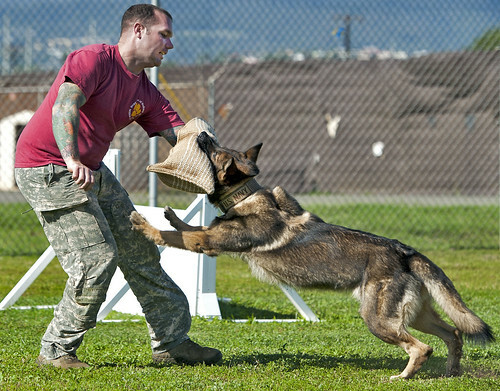 In Lowry v. City of San Diego, the Ninth Circuit held that City of San Diego’s policy of training its police dogs to “bite and hold” individuals resulted in a violation of plaintiff’s Fourth Amendment rights. After a night of drinking with her friends, Sara Lowry returned to her workplace and fell asleep on her office couch. She awoke a short while later and went to the bathroom, before returning to her couch and going back to sleep. Unfortunately for Lowry, during her trip to the bathroom, she accidentally triggered the building’s burglar alarm. Several officers from the San Diego Police Department (“SDPD”) responded, accompanied by a police service dog named Bak. After searching the area and giving several warnings, the officers released Bak into Lowry’s office. Bak found Lowry and pounced on her, tearing open her upper lip. Lowry filed suit against the City of San Diego (the “City”) under 42 U.S.C. § 1983, alleging that the City’s policy of training its police dogs to “bite and hold” individuals resulted in a violation of her Fourth Amendment rights. The district court granted the City’s motion for summary judgment, concluding both that Lowry did not suffer constitutional harm and that, even if she did, the City was not liable for her injuries. The Ninth Circuit decided that a reasonable jury could find that the police officers responding to the alarm used excessive force when they deliberately unleashed a police dog that they knew might well “rip the face off” any individual who might be present in the office. They also decided that the force used was excessive and that the City was liable. The Court reasoned that the SDPD trains its police dogs to enter a building, find a person, bite them, and hold that bite until a police officer arrives and removes the dog. However, police dogs are not trained to differentiate between “a young child asleep or . . . a burglar standing in the kitchen with a butcher knife,” and will simply bite the first person they find. The Court further reasoned that objectively unreasonable uses of force violate the Fourth Amendment’s guarantee against unreasonable seizures. Our excessive force analysis under Graham v. Connor involves three steps. First, we must assess the severity of the intrusion on the individual’s Fourth Amendment rights by evaluating the type and amount of force inflicted. Second, we evaluate the government’s interest in the use of force. Finally, we balance the gravity of the intrusion on the individual against the government’s need for that intrusion. Here, under these circumstances, the Ninth Circuit found that a reasonable juror could conclude that releasing Bak into the suite posed a high risk of severe harm to any individual present. Additionally, the officers would not have been justified in believing that Lowry posed a threat to their safety or to others. Throughout the entire encounter, until she was bitten by Bak, Lowry remained fast asleep on the couch. Lowry did not engage in any threatening behavior, nor do anything other than lie quietly before she was bit in the face. Finally, a non-residential burglary is not an inherently dangerous crime, and the fact that an unarmed suspect has broken into a dwelling at night does not automatically mean she is physically dangerous. Given that there is no dispute that the City’s “bite and hold policy” was the moving force behind Lowry’s constitutional injuries, the City was not entitled to dismissal under summary judgment. With that, the Ninth Circuit reversed and remanded this case for further proceedings.